Another new formula from Lobo, packed in the square glass bottle. 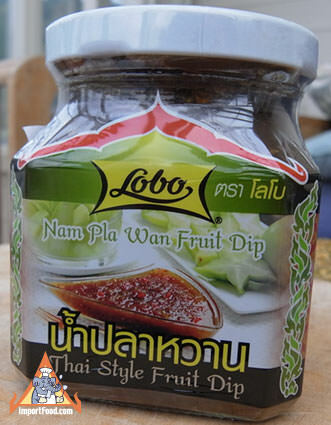 Nampla wan (nampla = fish sauce, wan = sweet) is a salty and sweet dip that has the consistency of jelly. Dip any fruit, especially sour fruit, into this before eating. Very tasty with sour green mango, radish, granny smith apple, or anything you might like. Ingredients: palm sugar, shallots, fish sauce, dried shrimp, salt, chile, water. No msg, no artificial color, no preservatives.